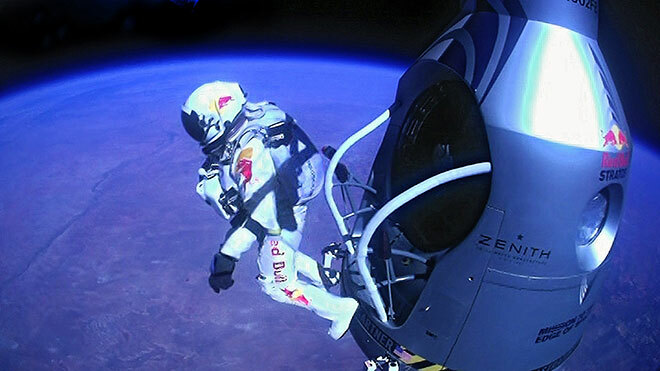 How many of us watched Felix Baumgartner’s amazing jump yesterday? Incredible, awe-inspiring, terrifying! There seems to be no lack of superlatives for this incredible feat of mankind. Whilst watching the amazing jump, I zoned out for a moment before realising which company was supporting him. I don’t know the exact mantra of the Red Bull brand but I have a reasonable idea of what they’re trying to convey – adrenaline, living on the edge, performance, live for the moment etc. It doesn’t really need a label, as we all pretty much get the gist of it anyway. And for those of us that are involved in branding, I can safely say that yesterday’s event was pure brand gold. Well they already do all three! (See below.) And in none of the above, is it an ill-fitting match. The Red Bull brand blends in perfectly with the likes of Ferrari, McLaren and Mercedes on the F1 grid. And it appears that Baumgartners jump wasn’t a cynical sponsorship option either. Yes, they would have been delighted at the subsequent brand kudos they received. But like F1, they get right into the nuts and bolts of the operation, actually getting their hands dirty along the way. I can also say that something could have very easily gone wrong yesterday. It takes a certain amount of guts to put your company name on such a dangerous activity. Red Bull really walks the walk in this respect. It probably explains why Toyota, a company, that is great at making road cars were so hapless in F1. Although familiar with the concept of making cars, the disciplines involved in F1 have nothing to do with those involved in making efficient and reliable road cars. It is Red Bulls extraordinary culture that enables a soft drinks company to credibly sell energy drinks and at the same time, help individuals to perform minor miracles like Baumgartners jump yesterday? Red Bull means something more than just energy drinks, they know exactly what they’re about and their actions never betray the brand. They will gain huge amounts of brand credibility from yesterday and sell more energy drinks at a greater profit as a result. Bravo! One further note, which car won yesterdays South Korean GP?